Between Keno and Copco Reservoir, the Klamath river crosses a plateau formed by volcanic rock that flowed northward from the Mt. Shasta area. The river has not yet had time to form a deep canyon in the relatively recent lava flows, or to smooth out rocks along the riverbed. There are many places on this run where rocks just seem to be in the wrong place, presenting an interesting technical challenge. Although it can be run year round, late summer is the prime season for this stretch, when blackberries are ripening, and few other rivers are flowing. There are good campsites along the upper section, although most people do this run in one day. Those who camp usually get their gear shuttled back along dirt roads to put-in. 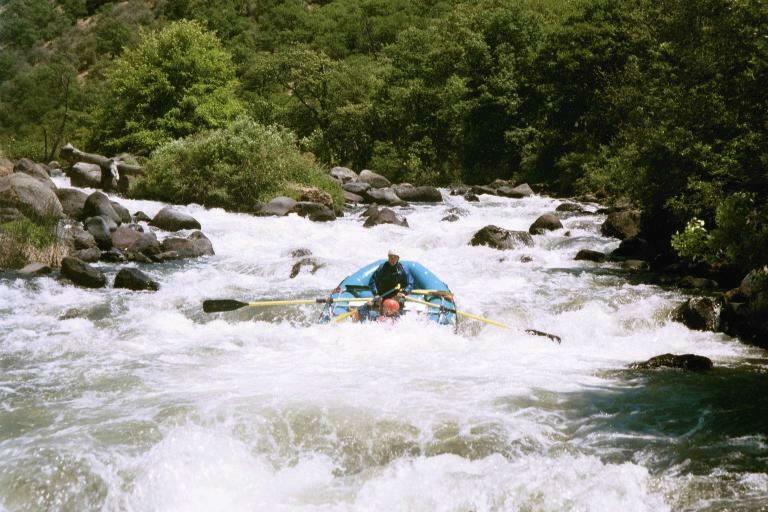 It is difficult to navigate the steepest 4 miles with loaded rafts, and a continuous gradient throughout the run makes for an easy day, despite the long distance. This is not the greatest run for kayaks, because unfriendly rocks could make swimming and rolling painful. Four rapids in the middle of the run are especially long and turbulent. Brown water and phosphate suds make underwater rocks difficult to spot. The bedrock, formed by lava flows, is unusually sharp and abrasive, threatening both boats and swimmers. On the plus side, there are few undercut rocks in this stretch. Californians call this the upper Klamath, because everything starting in Oregon is up. Commercial rafters call this the Hell's Corner run. 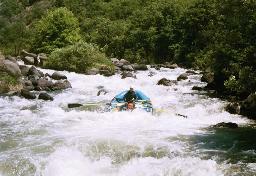 Rapids are class III at the beginning, then class IV with 75 fpm gradient for 4 miles, then class II-III until the end. Overall gradient is only 43 fpm. You'll encounter mixed wilderness and ranchland for 17 miles, with abundant bird and wildlife, and potentially good fishing. When one turbine is operating at the powerhouse, the flow is about 1700 cfs. When two turbines are operating (winter and spring), the flow is a stomping 2700 cfs. Rain and snowmelt can cause these flows to increase. Here is a trip report from Dorothy Champion (of fine arts fame) who swam Caldera rapid! Commercial outfitter Dean Munroe named most of the rapids on this section, unfortunately using satanic imagery. This description employs his names. Class II rapids begin immediately, with some respite after a quarter mile. After some more class II rapids, there is a large island where most of the current goes left into class III Osprey Rapid. Good campsite on the right. The busyness of the river diminishes somewhat. There is a class II+ rapid around mile 2, a BLM campsite on the right at mile 2.5, a class II rapid around mile 3.5, and a pair of class II rapids around mile 4.5. Frain Ranch is on the left between mile 5 and 5.7, offering an interesting side excursion, and some good campsites. The river turns 90 degrees right and then left, announcing Caldera just ahead. You can scout class IV+ Caldera from either the left or right bank. Rafts often choose routes on the left, while kayaks often choose routes on the right, so pick accordingly. This rapid is almost .3 mile long, and very turbulent at first. With rocks and holes everywhere, this is a bad place for a swim. Portaging is less strenuous on the right. After Caldera come three class III rapids, a class III+ rapid named Branding Iron, and a class II+ rapid, all in quick succession. At mile 7, the river bends right and pours into class IV Satan's Gate, which often requires you to keep to the inside (right) of the turn. Immediately below, eddy out on the left to scout the next rapid, the hardest on this run aside from Caldera. At high water, it is easier to eddy out on the right, but this makes scouting difficult. Hell's Corner is a .5 mile class IV or IV+ rapid, fortunately not as steep as Caldera, but full of rocks and maneuvering. The river bends left, curves left, bends right, then left again at Dragon's Teeth, where two underwater rocks form fangs to grab your boat. After this is a short pool, then an easier exit rapid. In June 2000, a passenger died after falling out of a raft in this rapid. The action continues as the river curves right into class III Jackass, and bends left into class III Scarface. Shortly after, the river splits around some islands, picks up speed, and turns right into Ambush, class IV, where large wrap rocks block the center and left channels. A large hole, class III+ Bushwhacker, waits below the last island. Two class II rapids with a pool between announce Salt Caves on the left bank. An opening in the cliff is visible from across the river. Please do not enter the cave, which is home to a rare species of bats. The beach below makes a good lunch stop. A long class II follows, then class III Pony Express, a long pool, class III Captain Jack, immediately followed by class III Roughshod. 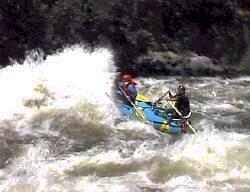 The last tough rapid, class III+ Snag Island Falls, is just ahead, where the river divides around an island. The left channel becomes an unrunnable boulder pile. The bottom of the right channel contains a midstream submerged boulder, which is easily avoidable if you see it. Now at mile 10, the gradient eases as rapids are spaced further and further apart. Watch for class III Wells Fargo around mile 10.5, and class III State Line Falls where the river curves left around mile 11.2. After this, there are some steep drops over old diversion dams, but nothing very tricky. In August, ripe blackberries line the river, but the swift current makes it hard to pick them. Most of the land along the lower river is privately owned, so camping is not allowed. At mile 14.5, an old logging chute is still visible on the right bank. The take-out at mile 17 is a nice one, being covered with grass and offering a variety of sun and shade for boat drying and relaxation. To reach take-out just upstream of Copco Reservoir, drive to where I-5 descends to cross the Klamath River, and take the Henley-Hornbrook exit. Drive east about 2.5 miles, then turn south and cross the river on Ager Rd. In about 3.5 miles, turn east onto Ager-Beswick Rd. After another 15 miles, pass Copco Reservoir, proceed to the river, and park near fishing access #1. To reach put-in, drive back to Copco reservoir, crossing on a bridge to the north shore. In 5 miles, turn north onto Copco-Pinehurst Rd, taking this dirt road 10 miles north to Oregon highway 66. Turn east on Oregon 66. Just before highway 66 crosses the Klamath river, still 6 miles west of Keno, turn south onto an unmarked dirt road that leads to J.C. Boyle powerhouse. The put-in is about .2 miles past the powerhouse, and involves a very wide left turn onto a rough road leading down to the river.